There are two important things to note about this recipe. 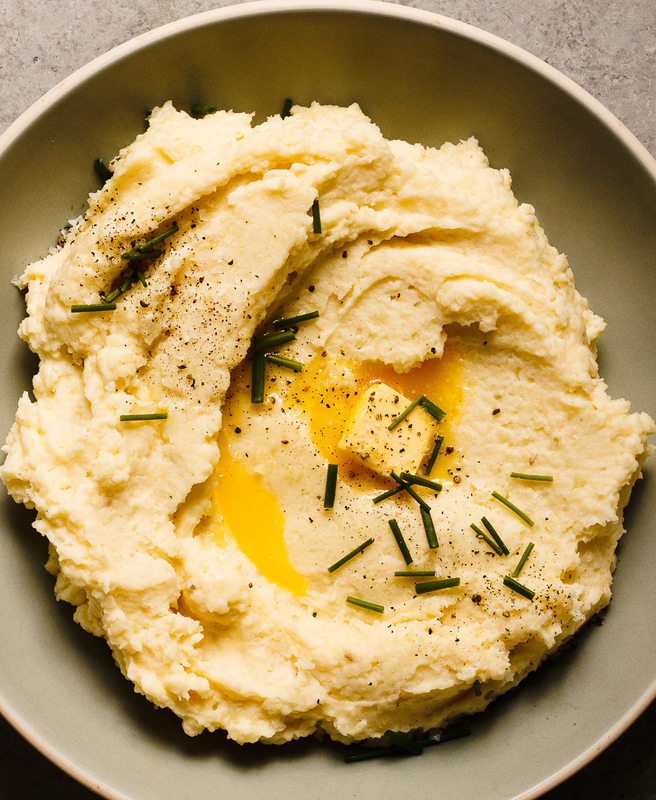 First off the cream is infused with all sorts of savory goodness adding a depth of flavor to these mashed potatoes. Secondly and probably most importantly, the recipe calls for using a ricer to mash the potatoes. When you use a ricer the result is an airy and creamy consistency that is absolutely perfect. Ricers are pretty inexpensive here is my favorite and there are a ton on Amazon as well. Place potatoes in a large pot. Cover with water and add a big pinch of salt. Bring the water to a boil, then reduce to medium and continue cooking potatoes until fork tender, about 15 to 20 minutes. Carefully strain potatoes. While the potatoes cook bring the cream, garlic, shallot, thyme, rosemary, bay leaf, peppercorns, and cayenne pepper to a boil. Remove from heat and let the cream absorb the flavors for about 15 minutes. Strain out the aromatics. Using a ricer, rice the potatoes into a large bowl. Top with butter and a large drizzle of the herb infused cream. Gently stir mashed potatoes, careful not to overwork the potatoes. Add more cream to get your desired consistency. Serve mashed potatoes warm and garnish with chives and more butter if desired.